Your music makes me see the world with different eyes, and everything is beautiful. trk 4 - A Voice - Yasmeen's Song CD 01:58 Sorry, your browser does not support HTML5 audio. 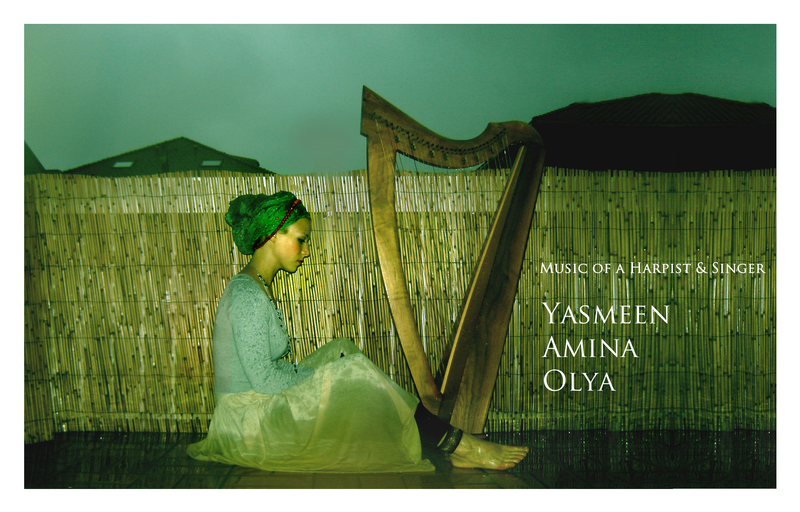 trk 1 - Mawlana - Yasmeen's Song CD 05:46 Sorry, your browser does not support HTML5 audio. 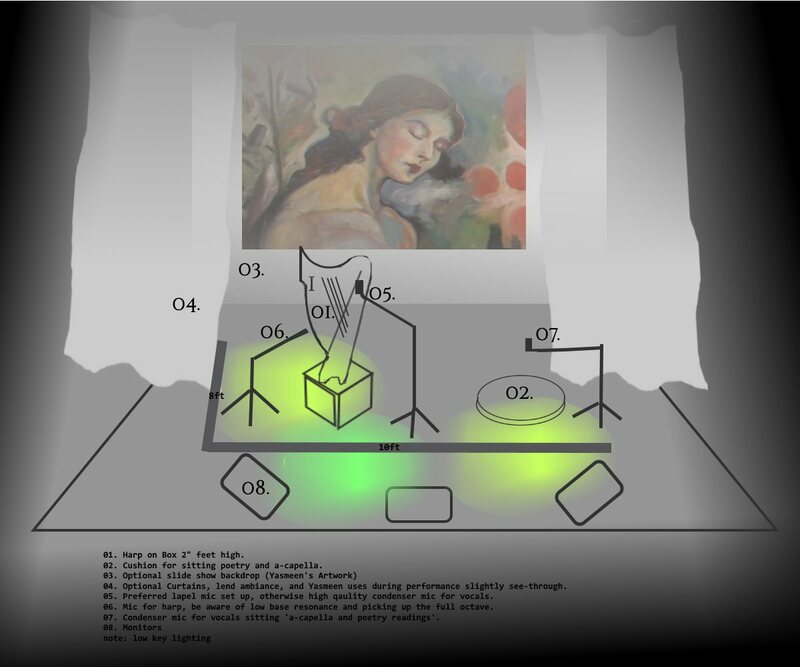 trk 2 - Cancaria - Yasmeen's Song CD 04:05 Sorry, your browser does not support HTML5 audio. Single Release - Blanket 04:05 Sorry, your browser does not support HTML5 audio. trk 1- This Path - Ocean's Rising CD 05:45 Sorry, your browser does not support HTML5 audio. trk 6 - Rosa - Ocean's Rising CD 05:12 Sorry, your browser does not support HTML5 audio. trk 8 - O Habibi - Yasmeen's Song CD 2:46 Sorry, your browser does not support HTML5 audio. trk 11 - My Garden at Sunset - Ocean's Rising CD 03:58 Sorry, your browser does not support HTML5 audio. Yasmeen Amina Olya is a vocalist and Celtic harpist. Yasmeen "sings in tongues" which is glossolalia. Glossolalia is a unique ability which Yasmeen uses musically, singing what only sounds like words in a language, they are improvised and fluid. This ability makes Yasmeen's ethereal music accessible across cultural and linguistic boarders. 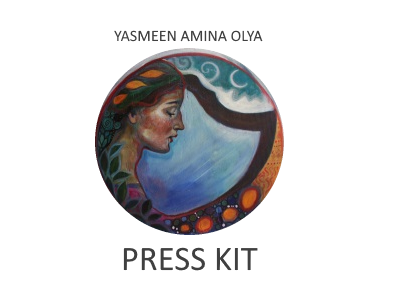 Using her music, visual arts, writing and poetry Yasmeen speaks to the unity of all peoples and faiths in celebration of our difference. Yasmeen is an adept performer, with a complete set of performances she calls "Seasons"; Spring, Summer, Autumn, and Winter. She uses her various talents, in music, visual art and performance to engage the audience. She speaks english and French. Her music is vaguely reminiscent of eastern european traditional sound, sometimes blues/jazz inspired. Yasmeen's performance can also include dance or motion acting out her own peotry and or poems from East and West in english and or french. She can collaberate with orchestra and other musicians easily she is a competent improvizational artist. A charismatic performer transcending boundaries, Yasmeen is ecclectic and inclusive, engaging the audience. 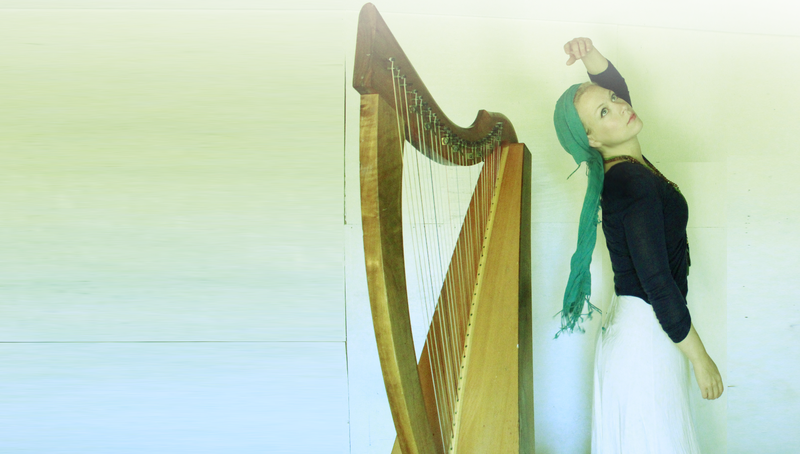 Her performance is suitable for both large venues, and small venues, world music festivals, period/medieval festivals. She is accustomed to performing for any size audience. Although her performance is composed for a mature and educated audience, she can adapt her performance to suite any age group. "I give of my art to express my personal wonder in the experience of living."